Synopsis: A young Pakistani man is chasing corporate success on Wall Street. He finds himself embroiled in a conflict between his American Dream, a hostage crisis, and the enduring call of his family’s homeland. Review: Every now and then a smaller movie rolls around that you feel like you should get a gold star for choosing to see over a more mainstream feature. There’s a certain sense of back-patting that goes on for plunking down your cash to see something more intelligent and timely than the latest 3D action adventure film playing on nineteen screens. 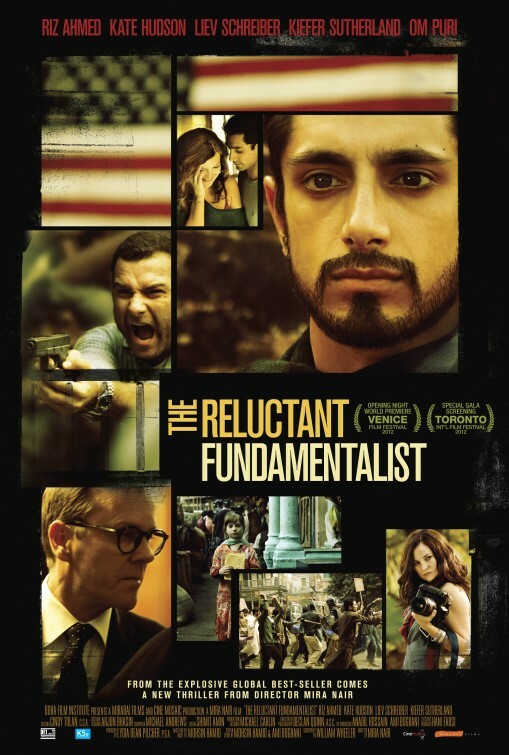 The Reluctant Fundamentalist is one such movie, a film that feels very prescient in our world that is still reeling in a post 9/11 culture…but it’s also a movie that you exit feeling you should get at least two gold stars for sitting through. Now let me say that I had high hopes for this one going in, though I’m weary of these types of international relations dramas I’m a fan of director Nair (Monsoon Wedding, The Namesake) and of many of the people involved with bringing this adaptation of Mohsin Hamid’s novel to the screen. The end result of this collaboration, however, is a densely worded rehash of a plot that feels overly familiar and a little late to the party. Not that Nair hasn’t delivered a decently oiled product for audience consumption because much of the film is rich with her trademark stylistic use of color and controlled narrative. Told in flashback between 2001 and 2011, the movie lives and dies with its lead performance and star Ahmed ably handles the role of a conflicted man torn between his ideal life in the US and possibly more important obligations at home. Ahmed is onscreen for nearly every frame and he fills up the space nicely. As he moves from college campus to the offices of a Wall Street corporation, he develops a relationship with a troubled photographer and that’s where the film takes the first of its missteps. I generally like Hudson and though she has a dynamite scene late in the film, for most of her short time on screen she seems lost in the role and abandoned by her director. I don’t think Hudson is necessarily wrong in the role but she looks so washed out and idle that it’s hard to pinpoint what our lead character sees in her. Schreiber’s character feels constructed to give Ahmed’s fundamentalist an outlet to spill his life story to and though we gradually see that there’s some complexity to the person Schreiber is portraying, the film never makes a case for why the two dialogue for so long with increasing unrest/danger outside their door. The best performance in the whole film is Sutherland as Ahmed’s superior, a bulldog of a businessman so tightly wound you can practically hear the gears grinding against each other when he walks. It’s through Sutherland’s scenes that the film has the biggest impact but sadly he’s not on screen as much as the audience wants him to be. This is a talky film that requires a lot of your attention – and maybe it asked more of me than I was willing to give in the screening I saw at the Minneapolis/St. Paul International Film Festival. It’s not a film I’d choose to see again and not one I could recommend to anyone that doesn’t have more than a passing interest in political films of this nature. It could use a slick trim of excess scenes (mostly Hudson’s) and a more focused approach to some final act business that feels unresolved. Reluctantly, I say this was a disappointment.